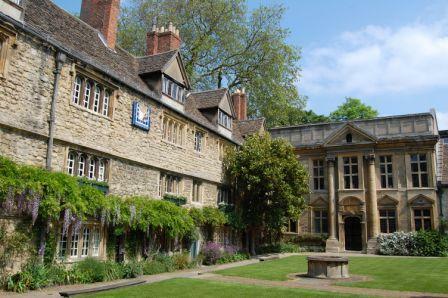 New Approach Workshop in Oxford: BOOK NOW or there won't be any workshop! Release your full musical potential. For violin, fiddle and viola players. The British Branch of the European String Teachers’ Association are pleased to announce that the recipients of their annual awards. The award “in celebration of a lifetime contribution to string teaching” goes to Kato Havas... Kato is well known both in this country and abroad as one of the leading violin teachers of her generation. Her best selling books have influenced players and teachers over many decades, and no one has engendered more loyalty and admiration from her many pupils. The Awards are to be formally presented at the ESTA International Conference in Oxford this summer. We'll run a New Approach workshop in Oxford, based on Kató Havas' works: New Approach to string instruments. 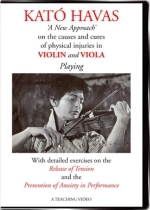 Find out how to eliminate tendonitis, tensions and aches and pains caused by playing violin, and even more, viola, eliminate stage fright and improve your tone instantly! 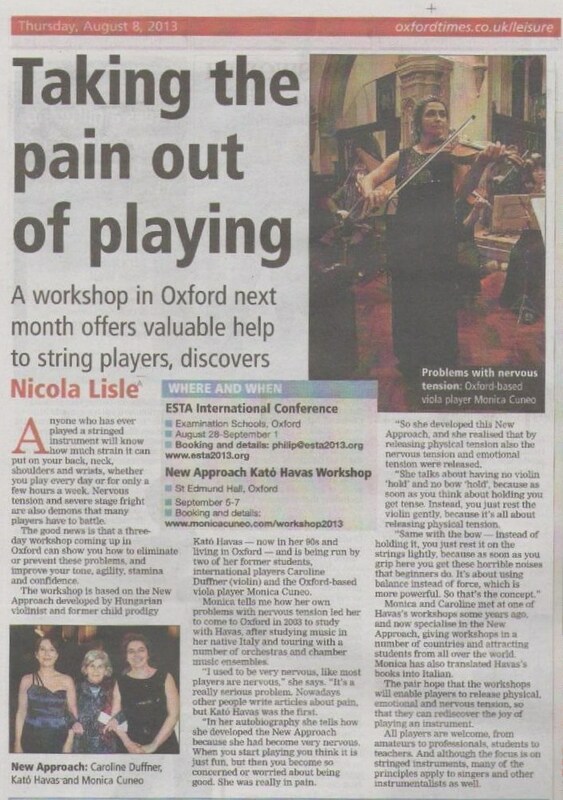 Just a few days before our workshop, Kato Havas will be giving a presentation about "Stage fright" on Sunday 1st September at this year's ESTA (European String Teachers Association) conference, which will be held in Oxford, from 28th August to 1st September. At the conference also the ESTA president will be present, the famous Italian viola player Maestro Bruno Giuranna, who will be giving a presentation and a masterclass. Our workshop will be after the conference. For anyone interested, it is an opportunity to combine the two things in a week's holiday: to see and hear Kato Havas in person and then come to our workshop. More information on the ESTA conference. Come to the workshop that Caroline Duffner and I will run on Thursday, Friday & Saturday 5 to 7 September 2013 from 10.30 to start at 11.00 am to 5.00 pm (with a lunch break) within the splendid framework of at St Edmund's Hall, Oxford, UK, 60 miles from London, continuing Kató Havas' tradition of her workshops. 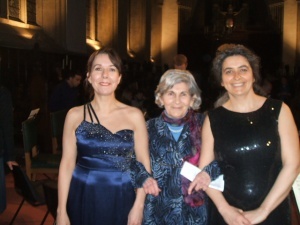 Caroline Duffner is Kató Havas’ representative in Austria; I translated into Italian three books by Kató Havas and am Kató Havas’ representative for violas in UK. Take advantage of this opportunity also to visit one of the most beautiful cities in the world, Alice's "Wonderland". Many resort to the use of tranquillizers, beta-blockers, alcohol or other drugs before exams, auditions, concerts, any public performance to overcome their stage fright. To me this is totally crazy! What would you think if other workers had to do the same simply to be able to do their job? Let's say, if a fireman were so scared of his task (with good reasons) that he needed to take some chemical stuff? Wouldn't you think there must be something wrong? Performing is the musician's job, whatever his or her level, whether they are amateurs, students or professionals. Yet for a lot of players, it seems that, the more seriously they study, the worse their situation becomes, with regard to stage fright. It's really a shame because it is possible to eliminate all nuisances that afflict players, in a very simple way, knowing the correct movements to do while playing: simple things that could help you improve your tone, increase your ease, your agility in playing, also by heart, eliminate the insecurity and therefore the anxiety, the stage fright. When you eliminate your stage fright, you will boost your self-confidence because you recover your ability to control this situation. The New Approach workshop in Oxford is open to everybody, especially violinists and violists, either teachers, students, professionals or amateurs. The New Approach principles can also be applied to other instruments. It's not just for classical players, but also for fiddle players and for players of any style. Always check you e-mail spam folder! We urge you to book well in advance as last year we had participants coming from as far away as Japan, Spain, Italy, Austria and others who do intend to come this year. Therefore, we and they need to know whether there will be enough participants. IF WE DON'T RECEIVE AT LEAST 10 CONFIRMATIONS BY 30TH JULY, THE WORKSHOP IS CANCELLED AND YOUR PAYMENT IS REFUNDED. To confirm your attendance, send £50 now and pay the balance on the first day of the workshop or send the whole REDUCED fee as explained above. After you fill in the form below, you'll receive details for the payment. Fill in the following form to confirm your presence at the New Approach workshop in Oxford. For those who wish, there will also be the the opportunity to have private lessons. Bring your instrument and any piece of music to play, to ask questions about. To book your accommodation, you'll need to contact the college directly. You'll receive details after you fill in the form below. Both have studied with me many years and are very experienced New Approach teachers as well as accomplished performers.